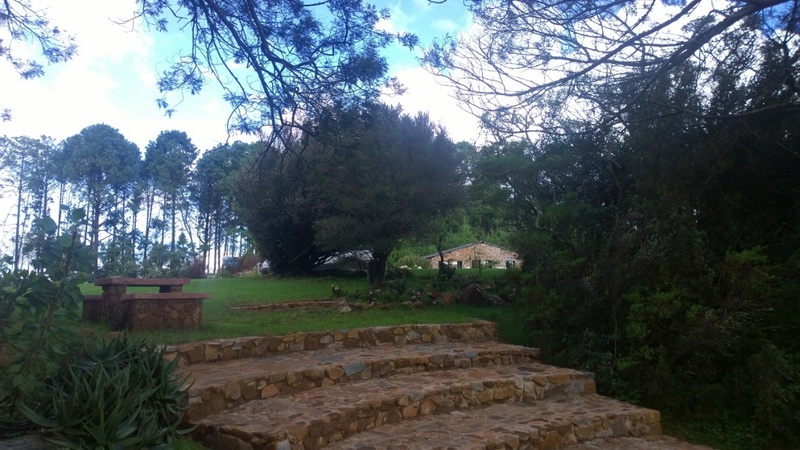 The property is set high on a hill that affords stunning views of the surrounding landscape. From an altitude of 2000m the escarpment drops 600m to the plain below. 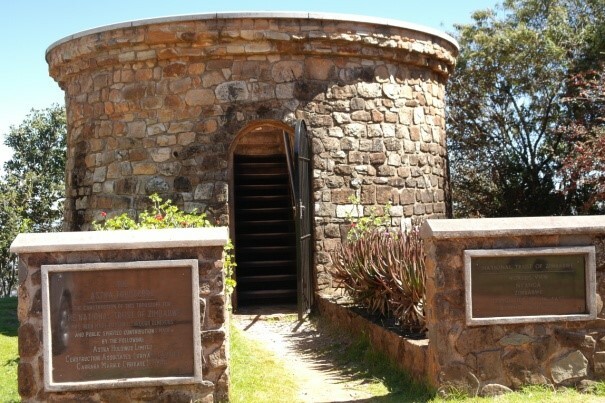 On top of the hill there is the large circular Astra Toposcope with numerous plaques of black granite around the perimeter with radiating lines indicating the direction and direct distance to thirty cities, towns and places of interest. 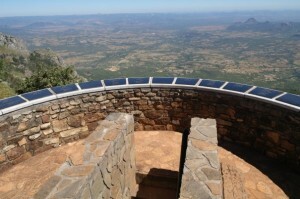 The construction of the Toposcope for the National Trust Zimbabwe was made possible through generous and public spirited contributions from the following companies: Astra Holdings Limited, Construction Associates (Pvt Ltd) and Carrara Marble (Pvt Ltd). The area is particularly interesting for botanists and ornithologists, comprising of vegetation types associated with either the basal granite or the dolerite cap. 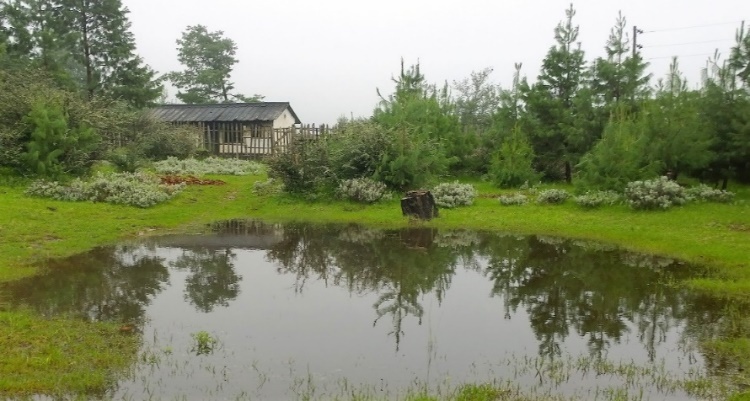 The mist belt area, of some 70 hectares, is located on the western edge of the Nyanga Downs plateau. Although not always clear there are traces of early stone walling in the grasslands and adjacent kopjes. 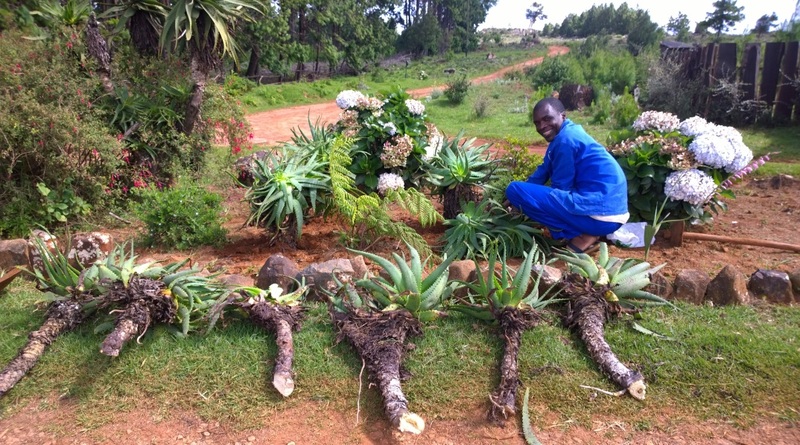 These are part of the unique Nyanga Cultural Tradition. 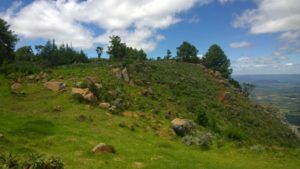 The earliest stage of the Nyanga Tradition is represented by a number of large, stonewalled settlements that crown some of the major peaks in the northern Nyanga highlands between World’s View and Chirimanyimo Hill. They are also found on some of the higher peaks of the Nyanga Downs. 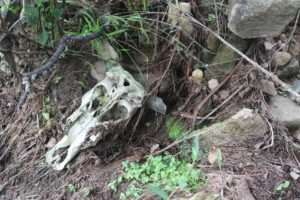 They date from the 14th to 15th centuries and lie between 2,000-2,400m above sea level in exposed locations unsuited to traditional occupation. The sites are characterised by small, walled hollows scattered amongst the boulders and linked by low-walled enclosures. They are large sites suggesting nucleated villages. The most extensive site on Chirimanyimo Hill may represent the residence of the local chief. 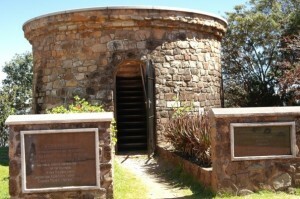 The enclosures were built as a double line of vertical stones, earth-filled in between. These may once have supported a hedge. The larger walled hollows probably protected livestock from the elements and are the prototype for later pit-structures. They had cobbled stone floors and in one of those excavated a grave was found dug through this floor. The smaller walled hollows were probably houses, the walls supporting a low roof. These villages were built at a time of a cooler, drier climate. They would have been very cold in winter, although it is possible that the cloud base was not as low as it is today so there was probably less, persistent mist. 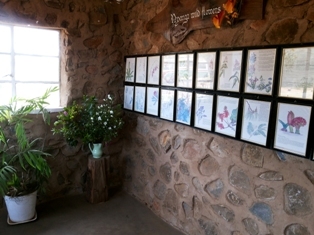 In 2012 a small extension added to the office, now known as ‘The Gallery’ where 26 framed pictures of the flowers of Nyanga by Mary Clark, a local artist, are displayed together with a large framed montage showing the construction of the Connemara Lakes and the surrounding road. 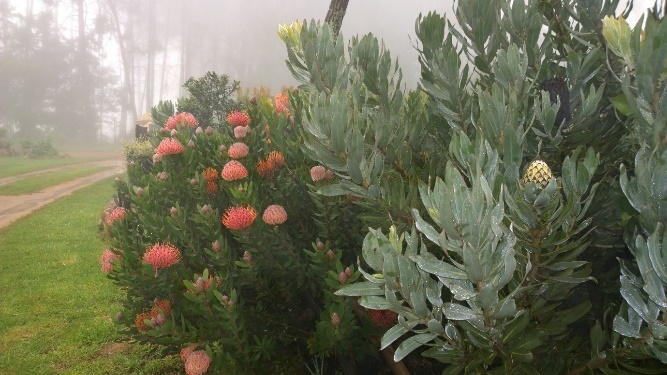 In 2013 the NTZ established a relationship with Kirstenbosch, the world famous botanical gardens in South Africa. 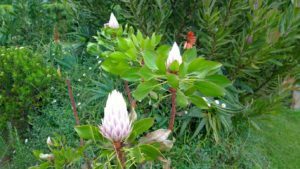 Seeds from 18 different protea species were generously donated by Kirstenbosch for planting in the new “Protea and Wild Flower Conservancy”. 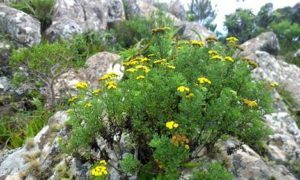 A site was selected, on a rocky kopje in an enclosed area, designated for the “Kirstenbosch collection” and planted in 2105. The NTZ strongly supports and promote local crafts. 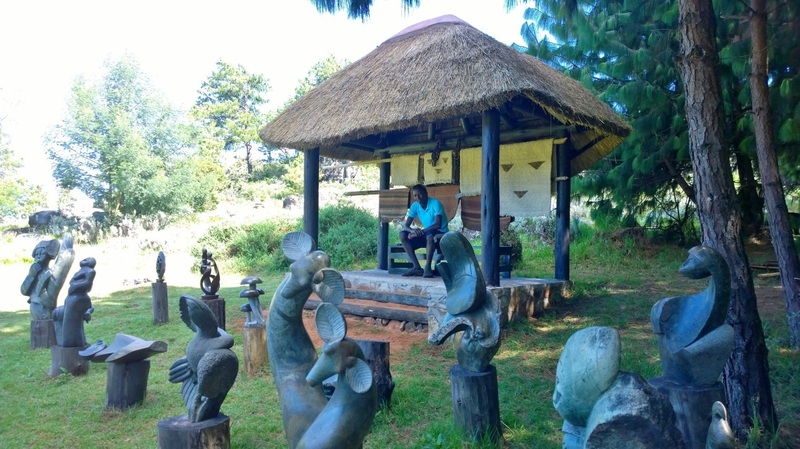 There is on site a Sculpture Garden and also also a gazebo where there is a small display of carpets made by The Zuwa (Shona for sunshine) Weavers Cooperative of Nyanga. Pottery and basketware are also offered for sale, The proceeds of these sales go directly towards helping support the families of these local crafts people, to promote their work and assist in training of the next generation. 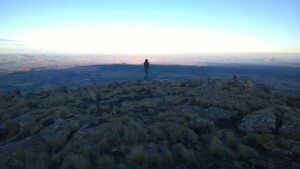 Sit above the clouds and birds flying and gaze down from one of the highest points in the land of Zimbabwe (approx 2,300 metres), across the central plateau almost a kilometre below. The view is of a land of mystery, of peace and of extreme beauty and it seems endless. As you gaze across the landscape spreading out in all directions beneath you, imagine a time before time when no human being was here. 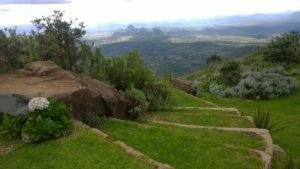 Move on through history to think of the earliest inhabitants of our beautiful country, the ‘Bushmen’, living life off the abundance of nature in surely what must easily be one of the most beautiful landmarks of Zimbabwe. Today the distant huts, hills and hamlets are bright and baked in the midday heat, then fade as the setting sun behind them throws its blue dusty shadows as it journeys to lands to the west when lights begin to twinkle and the chill of the highvelt evening, and the ever present wind sighing through the wattles and pines around you sound like the sea but you are in a land locked country. Your eyes are overwhelmed by beauty at every turn, you tread on the land of forgotten peoples that possibly inhabited the area in the 14th and 15th centuries, you can feel their ancestors and see the cultural history in the forts, stone walls, pit structures and square kilometres of massive terraces: all beautifully crafted and utterly intriguing. Everywhere. But built by whom? How? For what: Agriculture? Slave enclosures? Livestock protection? Self defence? Mining? All these have stood. And fallen. Only one thing is certain, and that is that these questions are not easily answered, and your favourite pet theory is as likely as any other. As you climb down into the valley in the morning freshness, limbs quivering with exertion and great lungful’s of fresh mountain air drink from cooling streams, feel the cooling breeze dry the sweat on your back and feel the pulse of primal life quicken in your ears and veins. Visit the art gallery, climb Mount Nyamtoro, bird watching, explore the unique Toposcope, wander around the protea and wild flower conservancy and investigate the built cultural heritage of the site. In Rusape, turn left (north) onto the Nyanga road. At about 95 km peg just before reaching Nyanga village, turn right onto the Troutbeck Road. At the golf course just before the Troutbeck Hotel (13 km peg) turn left towards the Tsanga Lodge (4 km) and the circular drive towards World’s View (11 km). World’s View is open to the public every day. WORLD’S VIEW ANNUAL REPORT: January 2017 to March 2018 The mountain experienced a very wet start to 2017, with rainfall for the season (to March 2017) of over 1700mm. The current rains had some serious hail and all three Connemara Lakes are again full and spilling furiously. 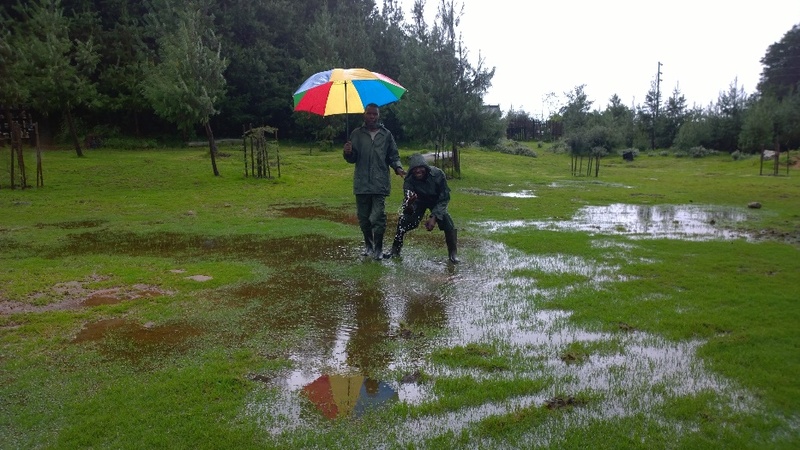 The torrential rains flooded the car park – it dried out gradually and reopened after some filling and levelling. The 2m wide x 30m long contour ridge that we dug at the base of Nyamutoro (World’s View Mountain) thankfully, prevented a more serious situation. Staff having fun in the waterlogged car park. Approach to caretakers’ Cottage before rainwater drainage system installed. We are a little more prepared in 2018 and extensive ground-work in December and January has prevented any further flooding. 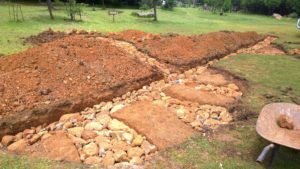 Backfilling of the pits and trenches that were dug to channel the rainwater away from the car park and down to the western slopes of the site. So far so good! 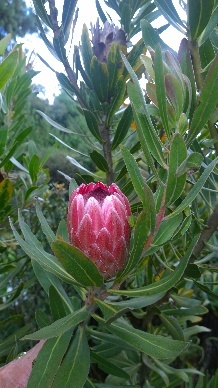 The rains have also brought on an abundance of wild flowers and the site is looking stunning. This is in stark contrast to the land outside the fence, where there is evidence of the damage and degradation caused by the cattle that are driven up the mountain to graze. The loss of the flora, fauna and birdlife that once inhabited the area is also of great concern: this due 100% to not only the overgrazing by cattle but also the ‘outsiders’ who come with their packs of hunting dogs, under the pretence of ‘looking for their cattle’, meanwhile they are carrying axes, clubs and catapults! The Little Connemara Estate was declared a bird and wildlife sanctuary some years ago but all the land on the outside of the circular drive that surrounds the Connemara Lakes was acquired by Government in 2002 for eco-tourism. Snares are constantly being found and removed by walkers and the Connemara residents. 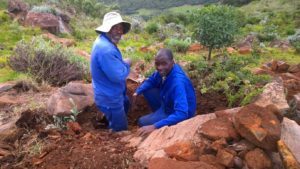 The firebreaks are not maintained and some of the land has been given over to potato growers who have exasperated the situation by ploughing and interfering with the natural springs that occur on the areas designated to them. 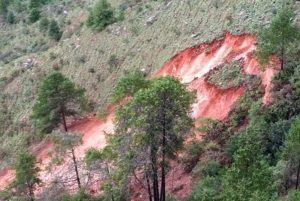 A large landslide beneath the World’s View toposcope occurred on a path made by the cattle coming up the eastern slopes. 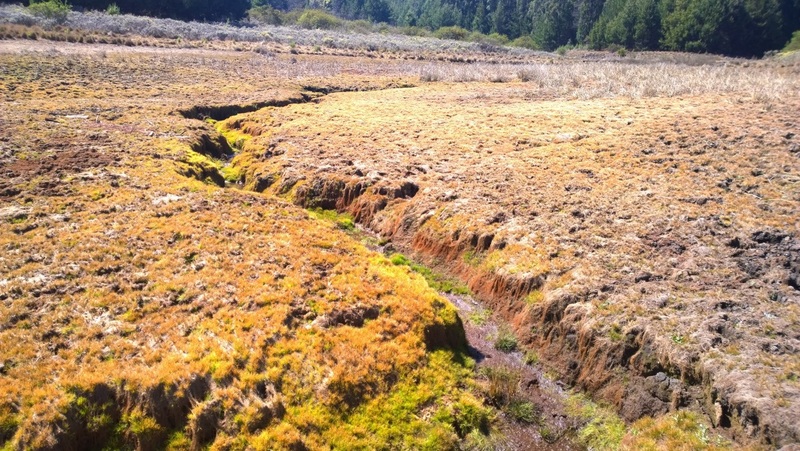 Ground cover being reduced through localised overgrazing and trampling has greatly increased the risk of further landslides due to the soil losing the ability to ‘hold’. Cattle ascending the slopes to the World’s View site. Who would believe it!!! There are some further sections that look like they may ‘go’ as well, as some large ‘cracks’ in the soil are apparent adjacent to the original fall. 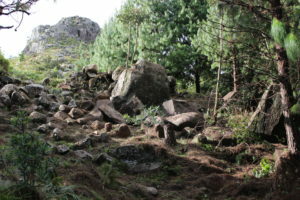 The upper slopes leading to the summit of Nyamutoro and some parts of the lower fenced area of the site are constantly being cleared of pine and other invasive species. It is an ongoing exercise to keep on top of this problem but Matirina with chainsaw and the caretakers with machetes have put paid to hundreds of these invaders and the larger trees have been felled and cross cut as firewood for use in the caretakers’ woodstove. Matirina at work on the invaders. Landscaping and planting the kopje to the south of the toposcope is nearly complete and the first flowering of the Kirstenbosch proteas graced the kopje in December. Mr Michael Tucker kindly donated two hardwood benches that were commissioned in April. 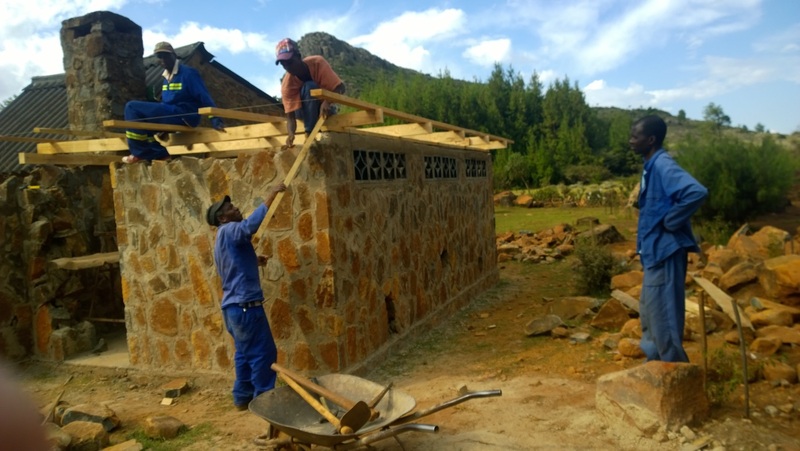 We are immensely grateful for this donation and the benches are the crowning glory of the kopje. In April the kopje was officially named The Helen Hyslop Kopje and a plaque unveiled in recognition of all that this amazing lady has contributed to the National Trust of Zimbabwe. 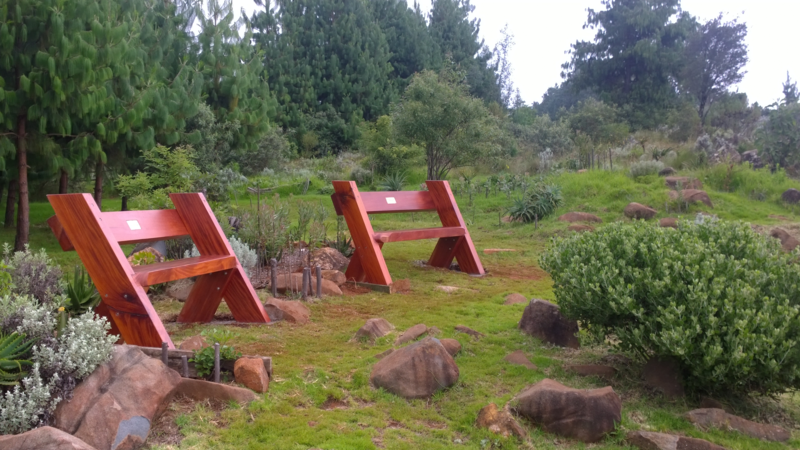 The benches donated by Mr Michael Tucker now grace the top of the Helen Hyslop Kopje and an indigenous shade tree has been planted between them to provide shelter on the occasional sunny day. Renovations and extensions to the staff housing reached completion mid-year. 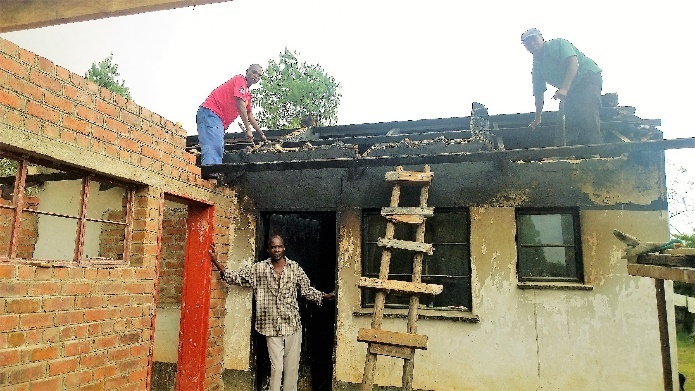 It was a busy time with builders, carpenters and plumbers all working on site at the same time: organised chaos, and thankfully the project ended without damage to life or limb. The old ‘long drop’ has been replaced with a flush toilet and new shower area created so consequently new piping had to be laid and a new soak away dug at the bottom of the caretakers’ garden. 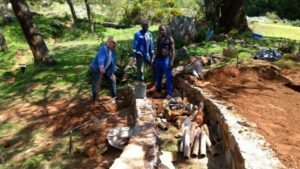 A large French drain has been laid at the top of the vegetable garden to take the grey water and help to keep their vegetables watered during the dry season. Instead of using the local stone we decided to do the extensions in brick/plaster to stay in keeping with the original structure. This has worked well and resulted in a neat and handsome little building. Luke in front of Caretakers’ house before work commenced. Note the smoke from the old cooker billowing out the kitchen and old shower room windows! Foundations dug and ready to start the new extension. Trying to remove the 30+ years of soot/grime that had built up on the old kitchen and toilet walls was not an easy task. Sugar soap, wire brushes and a lot of elbow grease managed to remove most of this before painting the interior could commence. An additional window has been fitted to the back bedroom. A new 35m length of picket fencing has replaced the old and rotting one along the road boundary which has enhanced that aspect tremendously. A pole fence has been constructed on the inner boundary, hedging planted and a ‘Staff Only’ sign put on the gate. The new veranda is sheltered by a shoulder high wall to give protection from the wind and a second wood burning stove installed. All internal rooms have been fitted with ceiling boards to stop condensation forming and the old inside kitchen has been turned into a sitting room. Curtains and some new cooking pots were purchased to replace the old blackened and many times repaired ones. Luke and Arthur are delighted with their new home and have asked me to convey their thanks to the National Trust for upgrading their accommodation. They have both worked over and above their normal hours to assist in this project and we are grateful to have such dedicated staff in our service. For the second consecutive year, yet another of our stone gate posts was ‘taken out’ by a bus, followed by an angry bull who ripped the wooden entrance gate into several pieces. Fortunately he was spotted and escorted off the property with his many lady friends before too much damage was done to the gardens! The 4th picnic table and benches have been completed and an upgrade to their surrounds has been achieved by new planting of azaleas and a bit of further landscaping on the terrace below. Bromeliads, newly planted at the top of the azalea terrace. It is rewarding to see the fruits of our labours coming to bear at last, the gardens are full of interesting beds that have now filled out and provide an array of different flowers throughout the seasons, although not all the plants are of an indigenous nature, they provide colour and interest for our many visitors. 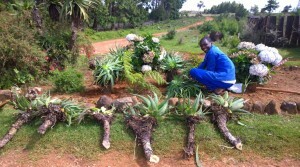 June Weeks continues to bring us aloe cuttings which are being planted along the escarpment. 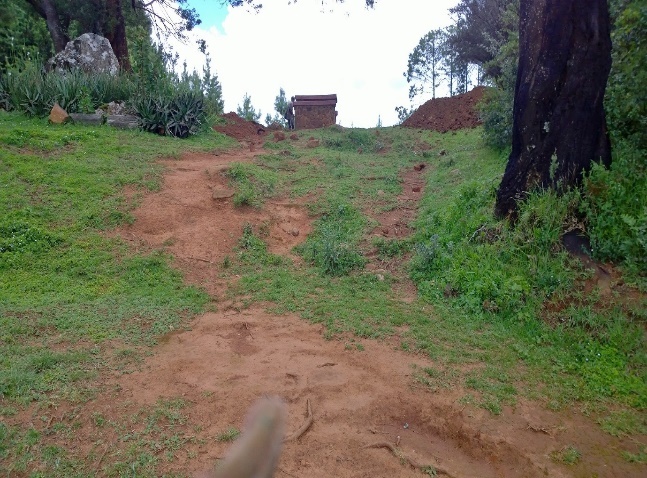 An old cattle track coming up the eastern slopes (now fenced), has caused considerable erosion, so to combat this a large semi-circular stairway using local stone, has been constructed. 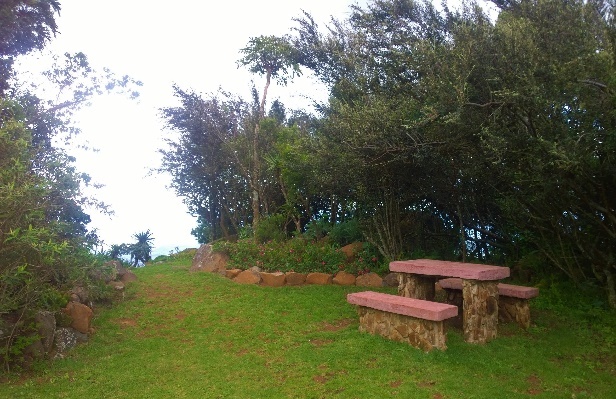 This is a great spot for large groups wanting to picnic and enjoy the scenery. Starting construction of the new steps. In 2018 we commissioned the services of Mr Jakob Raath to undertake an ecological study of the World’s View area. 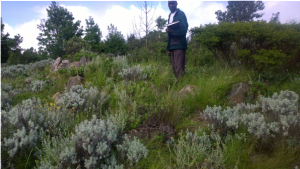 The overall aim is to have a database of ecological resources relevant to the area for posterity as well as being an aid in planning and making future recommendations for our site and environs. Phase I, the pilot study, was completed in January and he returned to site to complete Phase II mid March. 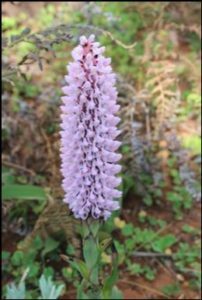 The aims of Phase II are to expand on the activities begun earlier as well as collect plants not seen flowering at the time of Phase I. New areas of the NTZ environs were sampled and more data about the overall environmental health of the area were gathered. In addition, an extra 2 volunteer days were spent removing the vegetation from the ruins above the car park to expose the sections of walling for future archaeological work. 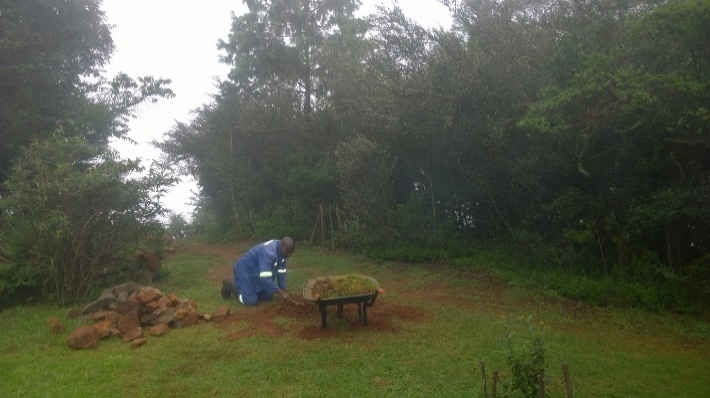 The removal of the vegetation was done in a methodical manner, taking care to cause minimal impact. 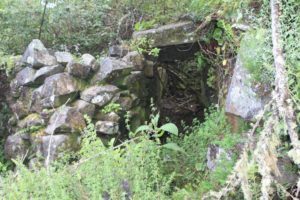 We had no idea of the extent of these ‘on-site’ ruins until Jacob, with the help of Gill, Matirina, Luke and a few broken machetes discovered that the ruins are much more extensive than first thought. 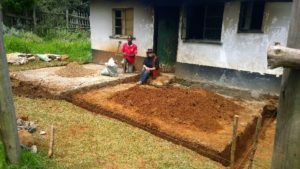 We look forward to the return of Rob Burrett to take his archaeological study further. 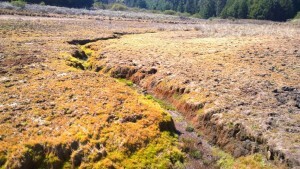 More of Jacob’s finding on the adjacent land to the south of the World’s View site, reveal that in this unique area a potential ecological disaster is in the making. 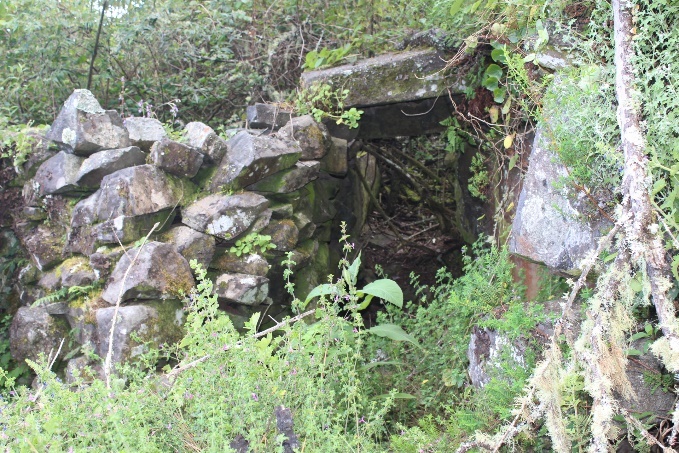 Steps are being taken to have this area placed under protection. 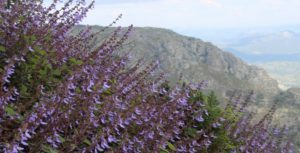 As recommended by Rob Burrett, a sign at the start of the path leading to the summit has been placed to make climbers aware of the conditions that may await them. Mist can decend in minutes so it is advisable to keep to the footpath and to keep a watchful eye for baboon activity. There was a drop off in visitors from September due to the ‘cash crisis’ and fear of harassment by police at road blocks. However, since mid-November this has greatly improved and we have introduced an Ecash system that works well (when there is a signal!). Our little ‘Plant Sales’ section is doing well and visitors are delighted to be able to buy plants that they can see in flower in our gardens. We continue to support Valhalla Nursery in Juliasdale for the azaleas and hydrangeas and Mrs Dalrae Bailey, also of Juliasdale, has become a recent supplier of well established protea plants. A very successful ‘ Carols by Sunset’ was arranged on Christmas eve by Lindsay Lees May, manageress at Little Connemara and Pam and Dave Lee and family, residents of the estate. 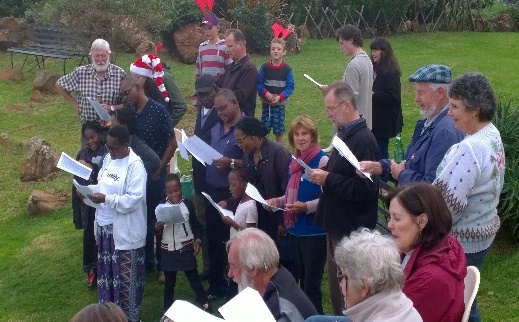 Word sheets and Christmas pies were handed out, the rain held off and ‘the hills were alive with the sound of music’. 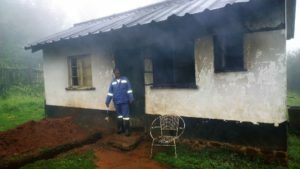 “I’m going to die a happy man – even more proud to be Zimbabwean after visiting this place with my family. Thanks to the hardworking guys for maintaining this awesome place”’ Lional Takawira, Guildord, Surrey, UK. 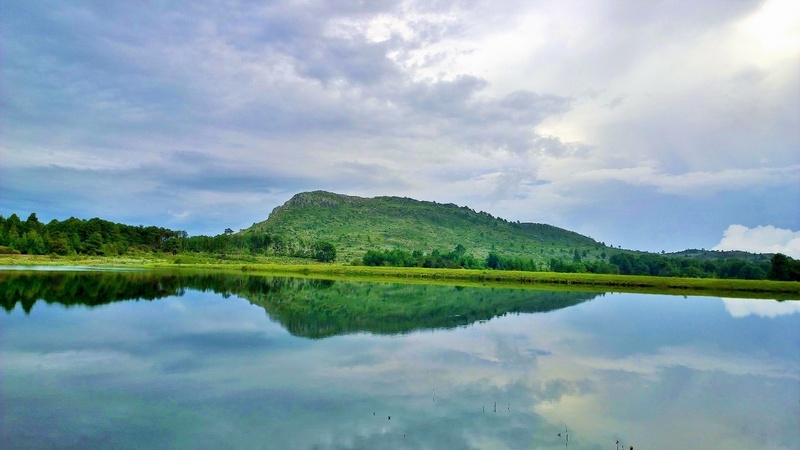 “This is one of the few places in Zimbabwe still intact and looking lovely as always”. Chervonna Gororo, Harare. “A return after more than 20 years and I really loved the re-visitation. More beautiful and extraordinary than I remember. Thank you for keeping it well”. Gynthia Baloyi, Ohio, USA. “We haven’t been to World’s View in years and have been amazed at the beauty and tidiness. The toilets must be the most beautiful and functional in Zimbabwe”. Snick Nkomo, Harare. Thank you all for your kind words of encouragement and a special thanks for the backup and support received from our Chairman, David Scott and the NTZ Council members in Harare. Reflection of World’s View Mountain on Lake Mare, the topmost of the three Connemara Lakes. The year began well with the number of visitors to the property continuing to rise, especially over long weekends and school holidays. The new toilet facilities, although not completely finished, were opened to the public on Easter Friday, just in time for one of our busiest weekends and very favourable comments were received, one of the most heard comments being ‘it’s good to see where our money (entrance fee) is going. We reopened the building site in early February and began work on Phase II: the new gallery extension and finishing the toilet block which still needed plumbing, painting and fitting of the vanity unit. The official opening took place on 22nd April when Mrs Scott (the wife of our Chairman) ‘cut the ribbon’ to the new gallery where a fine collection of work by some of our very talented local artists was on display. This was followed by a luncheon hosted by Gill Honeyman at her residence close to the View. Our thanks to June Weeks who has been working hard and made a large free standing board which allows a lot more space for display. In his speech, the Chairman, Mr David Scott, announced that the Council had agreed that the gallery would be called the ‘Gill Honeyman Gallery’ and that a teak plaque would be made to commemorate the event. The toilet block has since been finished and a paved ramp at the entrance installed, giving easy access for our disabled visitors. 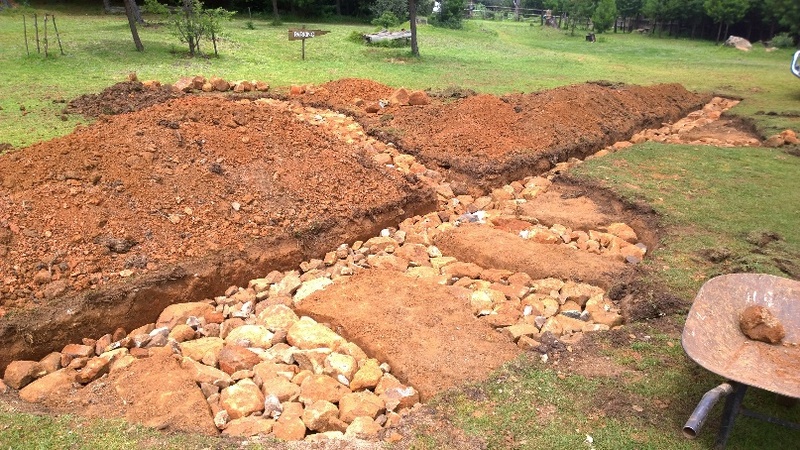 The landscaping project is now nearly complete but it has not been an easy task. 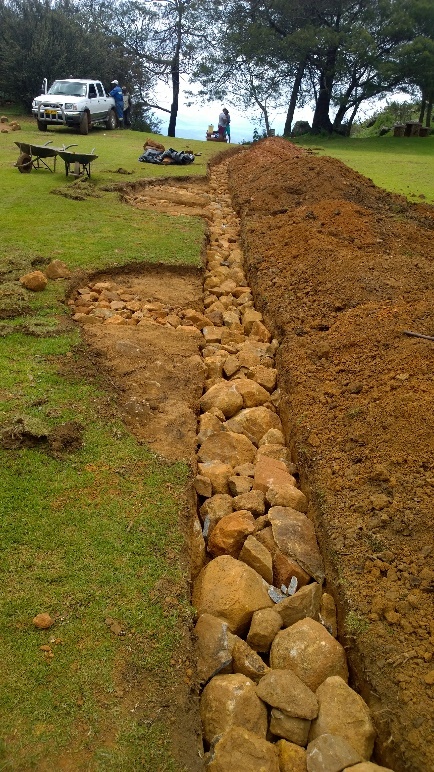 Large rocks had to be excavated to ensure that plant material would have sufficient space for root growth and drainage. 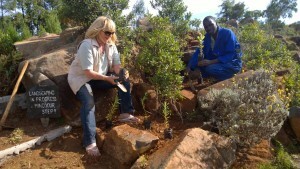 The circular path is now complete and planting out of the Kirstenbosch protea seedlings is ongoing. We have had some success with protea cuttings taken from June Weeks and Cherrie Stead’s gardens, these are being planted in the rough area above the kopje. 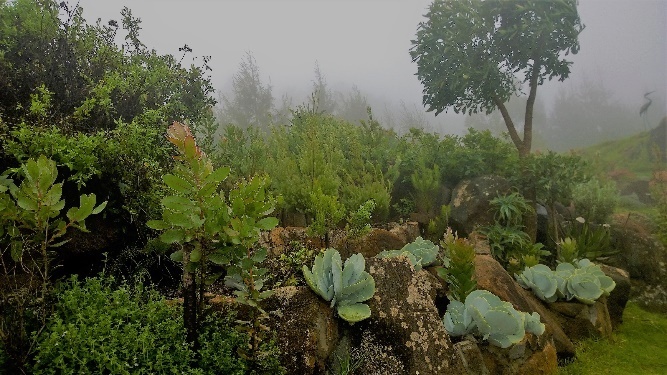 Some indigenous ‘cabbage trees’ have been planted on the top of the kopje and more aloes, azalea and hydrangeas in other parts of the gardens. 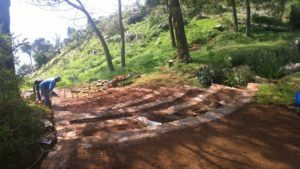 The circular drive has been slightly reconfigured and a number of small pathways below the toposcope and picnic tables have been cleared. The vast amount of lawn that we have been trying to establish finally reached completion earlier in the year with a bit of filling and levelling still to be done. 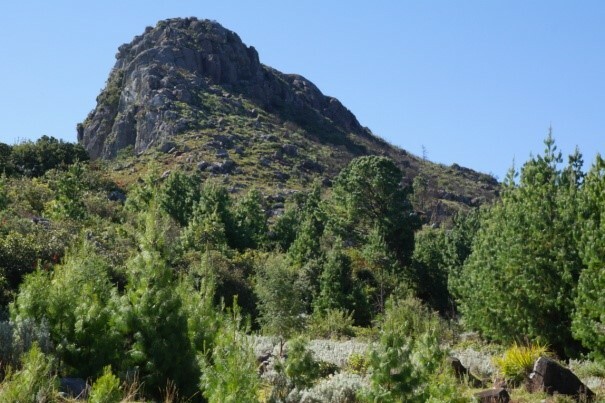 The Mountain Acacias in the parking area are struggling and not doing as well as hoped, however, they are still alive and we are hopeful that one day they will provide a magnificent shaded area for the car park. April was a particularly windy time on the mountain with gale force winds hitting us hard causing damage to signs and the wooden picnic tables and benches. 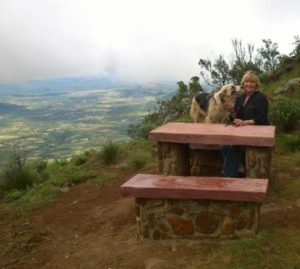 We have purchased another park bench to match the one donated by June Falcone and placed it at the top of the kopje where visitors can sit and appreciate not only the view but also the surrounding planted area. 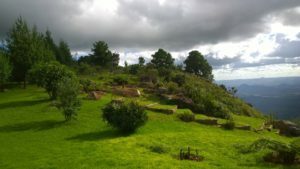 Matirina has discovered yet another ruins site, albeit not on the same scale as the others. This one is very conveniently situated a short way up the scenic walk (to the rear of the Sculptor’s Gazebo). 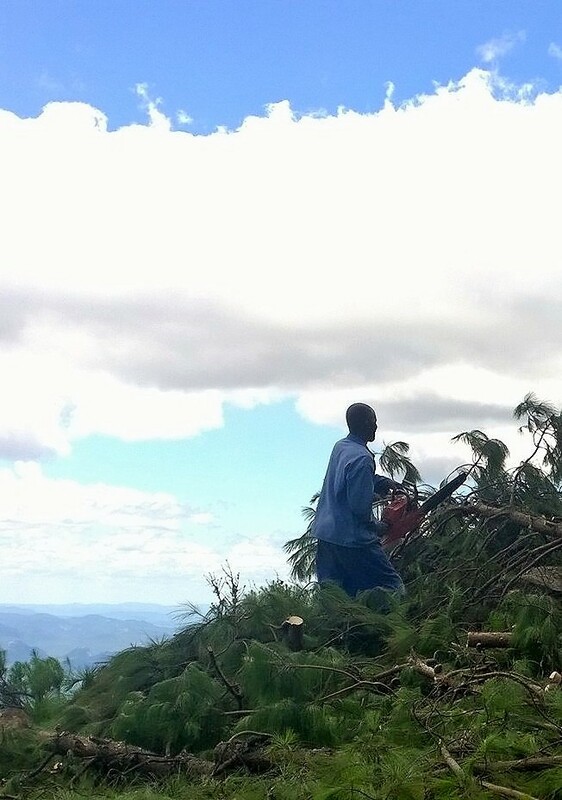 We hope to clear this of plant material and once cleared and enclosed/protected it will form another attraction for visitors who don’t want to make the ‘big climb’ to the top of Nyamutoro where there are other and more extensive ruins. This will not only provide an added attraction for visitors but also reflect Zimbabwe’s cultural heritage. The summer months saw the site looking amazing and we were asked if we would be willing to ‘rent’ the area as a wedding venue and also an approach by an ‘organiser’ to hold a weekend long rock concert. Unfortunately the latter would not be at all feasible or in keeping with the area but perhaps an afternoon classical recital would be more fitting. 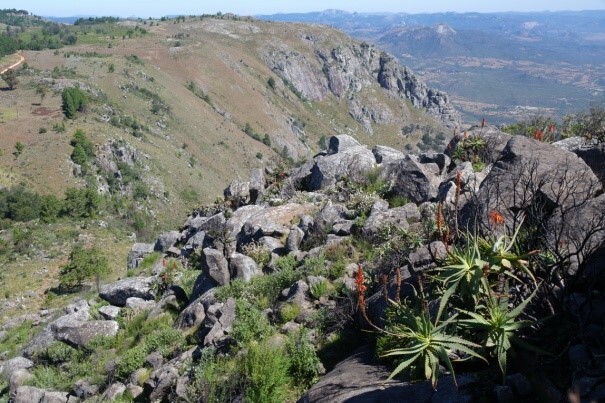 It is encouraging to see that visitors are still making World’s View one of the top spots to visit in the Nyanga area. August saw another record month of over 800 but September/October saw a decrease possibly due to financial constraints and tourism in the area as a whole was affected. We completed work on the construction of the first of our replacement picnic tables in November on an area above the existing picnic site. This has a magnificent view facing south-west over the escarpment and down to the valley floor below. The additional seating is much needed as a lot of our visitors now bring picnic lunches and all want a table. 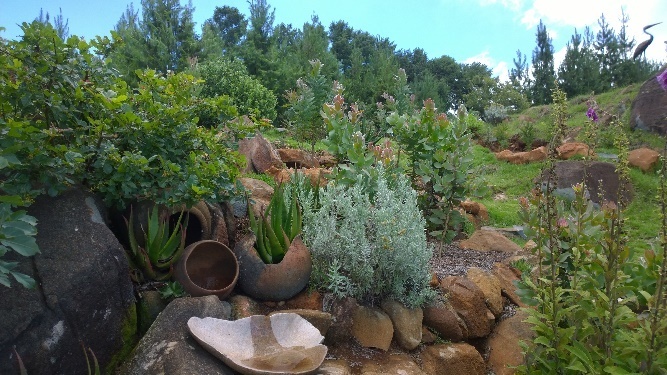 A lovely stone bench has been built on the far side of the protea kopje beneath a massive granite rock which makes a great wind break – this will probably be the most popular seating area on site. Picnic table number 4 is near completion and Nos 2 and 3 were completed and commissioned in December. All have been constructed from local stone and fit in well with the natural surroundings. ‘Have just returned from Nyanga and some of the tourist sites are getting a face lift. So impressed with the loos at World’s View that I took a photo. Spotlessly clean, totally refurbished, small cacti growing in novelty red clay containers and even a small indoor garden! Bushman painting mural on a red clay background. Wow, I have never seen loos like this at any tourist site except in Germany which is famous for its facilities. Staff were very helpful and accommodating. Such a pleasure to see in our beautiful land’. The rains were extremely heavy in December with torrential downpours and due to the volume of traffic coming onto site the parking area was turned into a quagmire. We dug a 2m wide contour ridge at the base of Nyamutoro which diverted most of the run-off from the mountain and hopefully this will solve the problem for years to come. 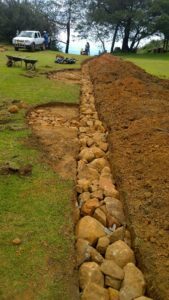 There were problems at the entrance gate as the culvert was removed by Nyanga Rural Council when they graded the road in 2015 and there is just nowhere for the run-off from the road to go. We battled daily to remove the red soil/mud collecting at the gate and have opened new mitre drains to divert the water down into the lakes. More work will be undertaken in the new year. 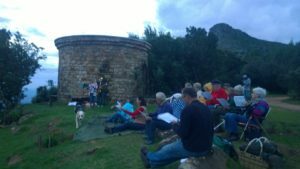 We are grateful to the Stead Family from Connemara who organised a ‘Carols by Sunset’ on Christmas Eve, the grandchildren playing flute, trumpet and sax. ‘Hark the Herald Angels Sing’ will never be the same again! The rain held off and although our numbers were small it was an extremely enjoyable evening. The Hydrangeas have been magnificent this year and we have had a lot of enquiries from visitors as to where they could purchase these plants. 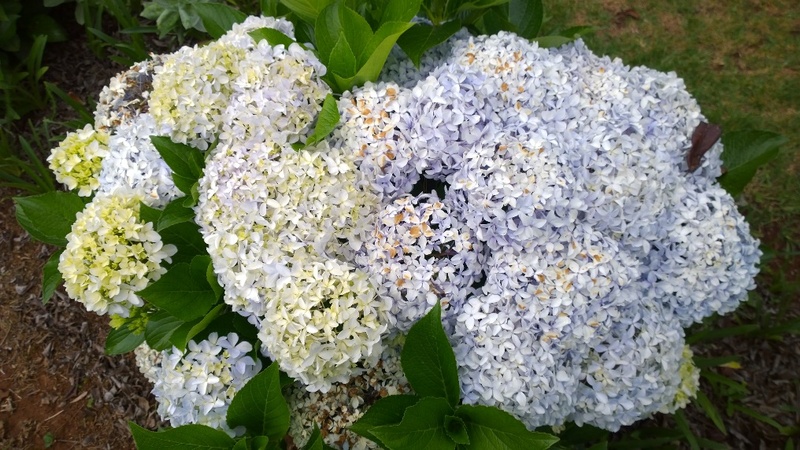 An approach was made to Valhallah Nursery in the valley who specialise in hydrangea and azalea and a mutually beneficial agreement was reached and we now have a ‘Plant Sales’ area. We have since decided to stock other seasonal plants that grow on site and we are sure that our ‘Plant Sale’ section will continue to do well. We have purchased some more lovely books for our small library and they have been very well received and read by visitors, mainly those taking shelter in the gallery when it rains. A lawnmower has also been purchased so we no longer have to borrow. Our ‘sign writer’ has been busy and painted a number of new metal signs: ‘NO FIRES’, ‘PLEASE TAKE FOOD WASTE HOME – BEWARE BABOONS!’, and others that will help visitors find their way around more easily. The art gallery is attracting much interest and most visitors are surprised and impressed to find an art gallery on the top of a mountain! We even received an approach from an artist from Harare who enquired if he could hold an exhibition of his own work in the gallery. Our very grateful thanks go to Val Cameron of Juliasdale for her donation of a large pastel of a scene in the Fox Rock area and a smaller one of wild flowers. Val is a professional and very accomplished artist and we are extremely proud to have her work in our collection. Our thanks also to Cherrie Stead for two beautiful water colours that she has donated, they have been framed and now grace the gallery walls as part of our permanent collection. We are still encouraging local Nyanga artists to bring us their work for display/sale. Matirina Andras, our treasurer, continues to be one of our biggest assets, not only keeping a meticulous record of accounting and ticket sales but also assisting in management of the staff, gardens and, of course, the Protea Project. Due to the increase in visitors, some who like to chat and have a guided tour of the gardens and the ever increasing garden maintenance etc., we decided to recruit another caretaker, Arthur. He is doing well: interacting with our visitors, learning about the flora and the history of the area. Therefore plans have been drawn for the extension and refurbishment of the staff accommodation block. 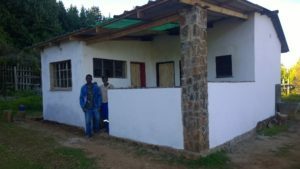 It is our intention to build on another room to accommodate the second caretaker and to completely refurbish the toilet and shower room. A covered courtyard will also be incorporated and a wood burning stove purchased to upgrade the kitchen facilities. Some roof repairs to the existing building are required and repairs and repainting to existing walls – inside and out. A long overdue refurbishment which Luke and Arthur (our caretakers) well deserve. We are pleased and amazed to report that we had an all-time, record breaking month in December with over 1500 visitors, mostly over the festive season – 300 visitors on Christmas Day, 200 on Boxing Day and 250 over New Year! 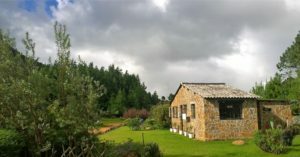 The World’s View Committee, consisting of Mr Rob Barrett (Chairman), Ms Matirina Andras (Treasurer) and Mrs Gill Honeyman, have managed to maintain the property in good order and repair throughout the year despite financial constraints and the extreme weather conditions that prevail on the Mountain. It is with regret that Mr Rob Barrett resigned as Chairman late in the year but happily he will still remain on the committee and with the appointment of Mrs June Weeks to our committee we face the challenges that 2016 will bring with renewed enthusiasm. 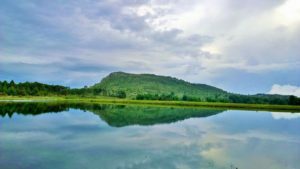 Thanks to the much improved 7km long stretch of road up to World’s View the number of visitors to site has increased greatly which has brought in much needed revenue through entrance fees and donations. As a result, we have started various projects which will improve the site for our many visitors. 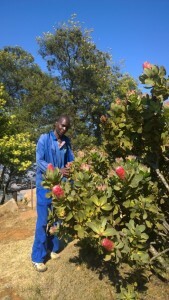 A new toilet block, to the rear of the existing office/gallery, is nearing completion and the installation of the new 5000lt water tank will be of great benefit, not only to service the new toilets but also to maintain the existing garden and future planned planting of indigenous species and our protea collection. A further extension to the gallery is in progress which will enable us to display interesting exhibits depicting the flora and fauna that are prevalent in the area. 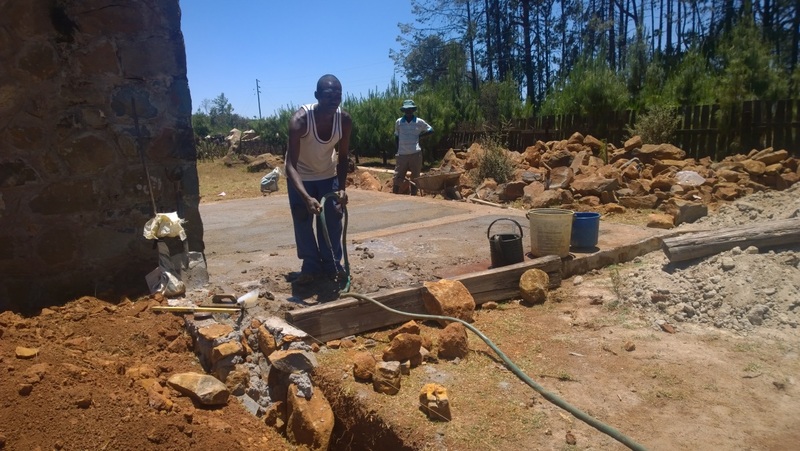 Gallery extension and new toilet block – work in progress! 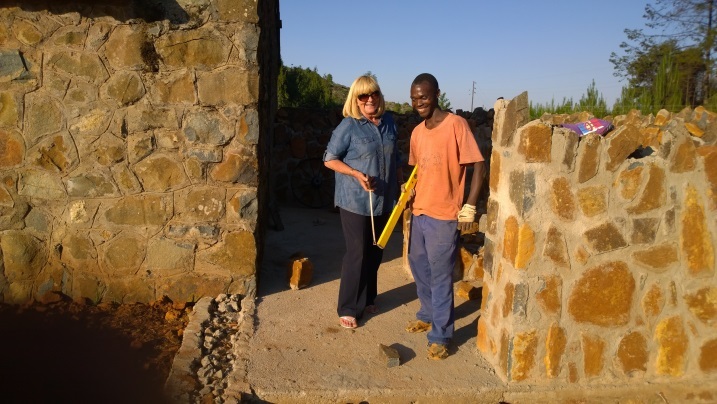 Gill Honeyman and Lashmore Kanyango, stonemason. Carpenter, Steven Goora and assistants, starting work on the roof overlooked by Matirina Andras. 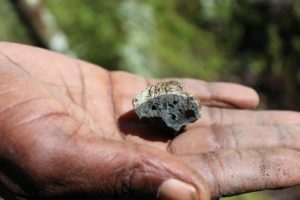 The current drought that is devastating the country has also taken its toll up on the mountain. The Connemara Lakes which supply water to site are extremely low with the top Lake, Mare, nearly empty. Rainfall has been well below the national average for the whole of 2015. This situation has been exasperated by the work of illegal potato growers who have damaged or diverted a number of natural springs that occur and would have kept the lakes topped up. The growers have ploughed huge tracts of, what used to be, beautiful natural grasslands and wild flower areas adjacent to the National Trust’s property, making it essential for us to now completely fence the 72ha site to save it from a similar fate and also to keep out the ever increasing number of cattle that are being pushed up the mountain to graze. 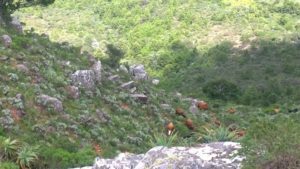 We thank the Chairman and Board of Little Connemara in their continued efforts to maintain the area as a Bird, Wild Life and Flora Conservation area – an ongoing exercise which is essential if we are to preserve this amazing area for future generation Zimbabweans and international tourists alike. 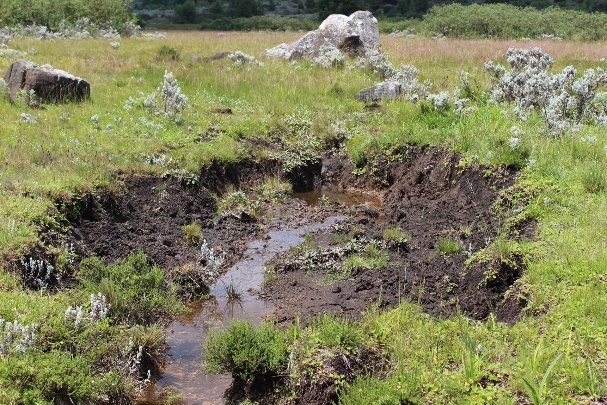 Photo showing the path of a natural spring that once ran into Lake Mare – now destroyed by illegal cultivation of land that was taken from Little Connemara and designated for eco-tourism. There were a number of fires that swept through the area late in the year and only through good management of firebreaks were we able to keep damage to a minimum at World’s View and on the Little Connemara Estate itself. Firebreak that managed to contain a large fire, with the help of some volunteer ‘beaters’. Landscaping of a small rock Kopje is well underway and some ‘planting out’ of our home-grown protea seedlings is currently taking place. 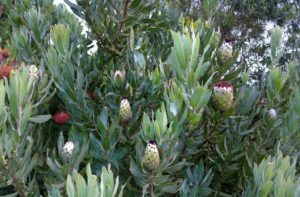 The seeds were donated by world famous Kirstenbosch in the Cape (South Africa) and have been lovingly tended by Matirina and myself over the past year. 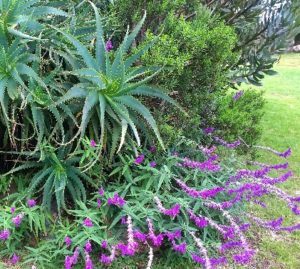 They will greatly enhance our existing Proteacea collection as some of these varieties have never been grown in Zimbabwe before. 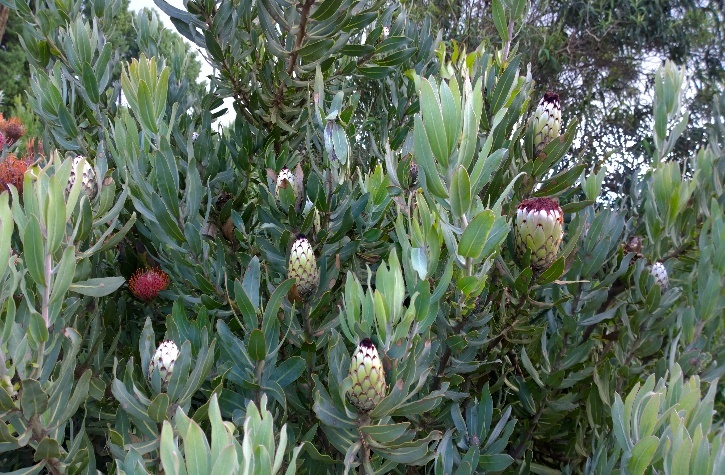 Matiria with Protea Grandiceps. Planting aloes at entrance. 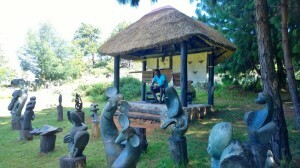 A new gazebo has been built for the Sculpture Garden at the base of Nyamatoro. 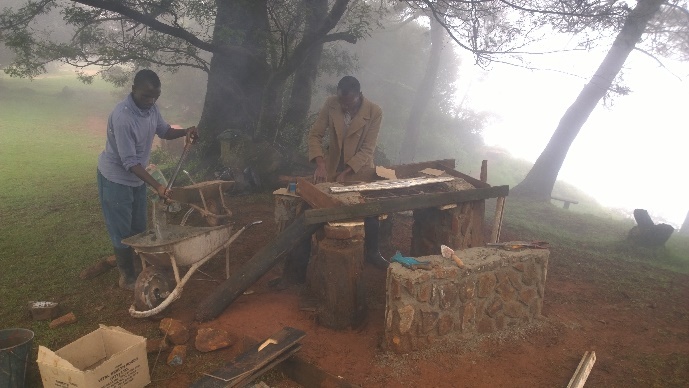 The sculptors are extremely grateful as this provides shelter in inclement weather and also further space to display their work and also that of the Zuwa Weaver’s Co-Operative hand made carpets. 2016 will be a busy one, not only finishing off the current projects but many more that we have on the drawing board to further enhance this beautiful property on the mountain. 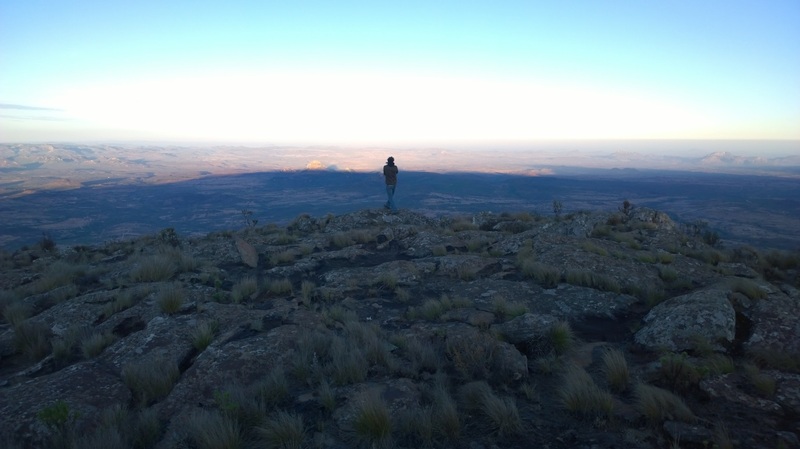 Sunrise- facing west – one can almost envisage the curvature of the earth in this panoramic view from the edge of the escarpment.